Ian "Nuggs" Ziobrowski from Genuine Artikle is teasing us with some sweet previews of the Dunnys they've collected for The Almighty Dunny Show, which kicks off December 11 at Halcyon (57 Pearl Street) in Brooklyn. 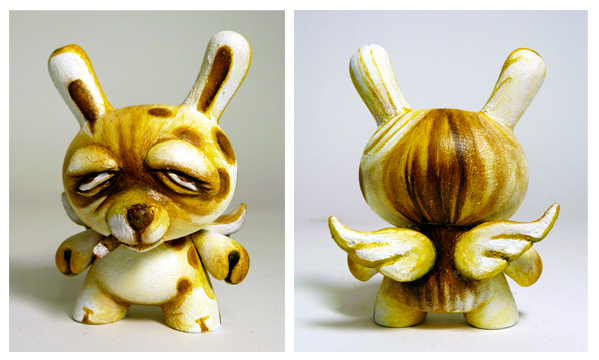 This 3-inch custom Dunny is titled "Berbitt" and it was created by the talented JCRivera. 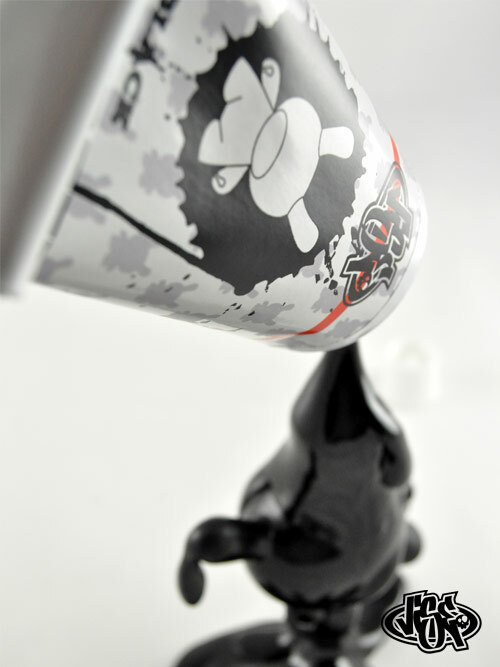 Stay tuned for more previews of Almighty Dunnys! Monday: 25% off with Cyber Monday coupon code! 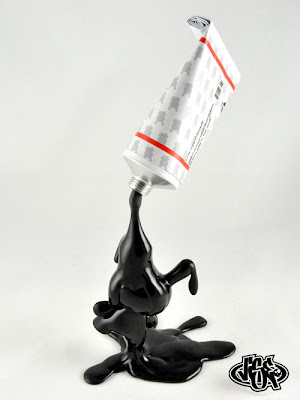 Sign up for our email list now so you get our coupon code this weekend. 25% off all in-stock production toys this upcoming Monday, November 29th. Coupon will ONLY be emailed; it will not appear here or on Facebook. VISEone Tube Dunnys will blow you away. 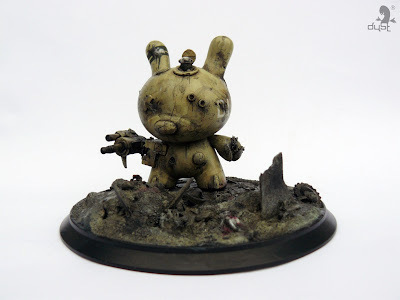 This absolutely incredible and beautiful Dunny custom is the work of German artist VISEone. 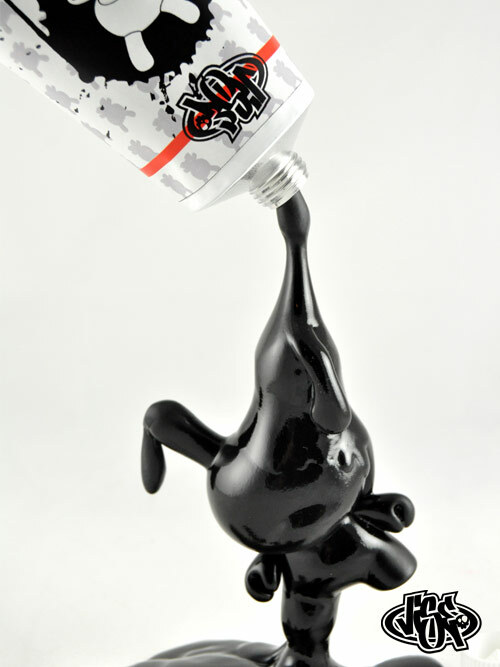 One will be displayed at the Almighty Dunny Show December 11th at Halcyon in Brooklyn. Colette from Tomopop unboxes a David Horvath Vintage Bossy & Friends set that we sent to her! You can buy yours here. DUST is an amazing customizer- here's a 3-inch Dunny he's entitled "Teddy Tank," done for the Almighty Dunny Show starting December 11th at Halcyon in Brooklyn. Props to Genuine Artikle for curating an absolutely ridiculous show. 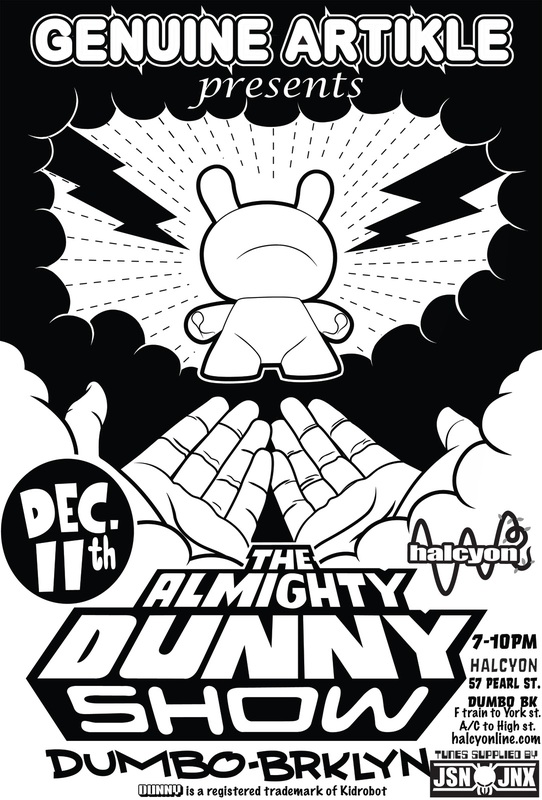 Genuine Artikle would like to announce "The Almighty Dunny Show" curated by Genuine Artikle and hosted at Halcyon in Dumbo Brooklyn. On Dec 11th over 250 customized 3 inch Kidrobot Dunnys will be on display at Halcyon from 7pm to 10pm. Many of today's hot designers will be represented in this weekend only event in the heart of Brooklyn's underground. 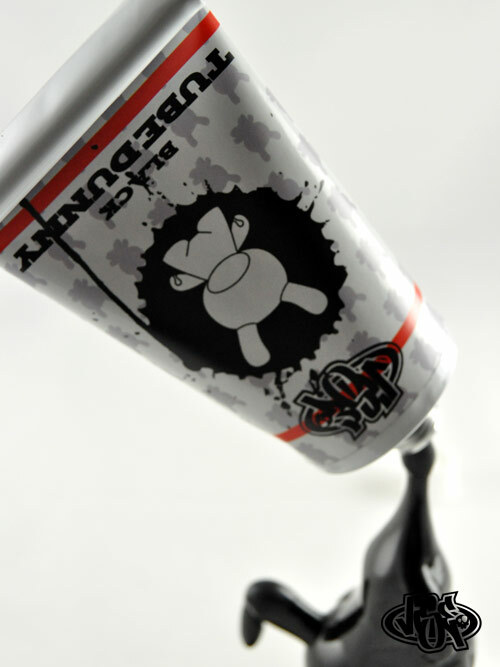 The Dunny is referred to as the top designer toy platform. It is only produced in a printed form, so all pieces for the show were stripped bare and mailed out to national and international toy designers, graffiti writers, street artists and graphic designers. Come join us for a free night of art and a special set of music provided by legendary Brooklyn DJ JASON JINX. First up in a really SWEET series of Hello Kitty artist crossover pieces by Kidrobot is this "Magic Love" Hello Kitty 6-inch vinyl figure by Tara McPherson. We are celebrating 50 years of Sanrio, here, people, which makes me feel hella old. 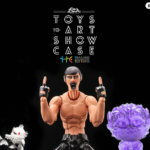 But this lineup of artist-designed Hello Kitty figures is looking amazing. 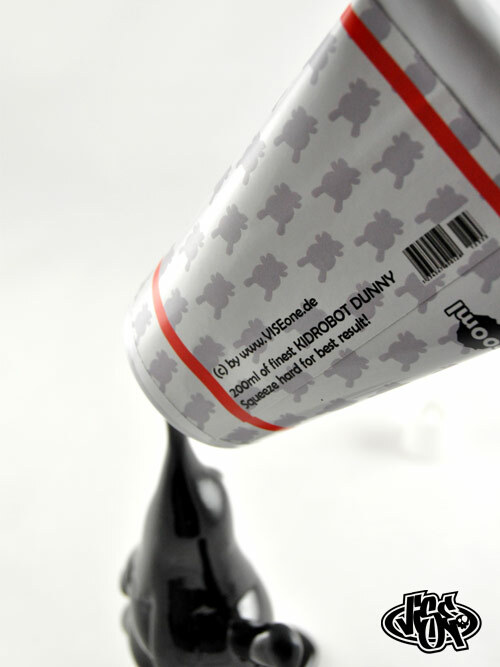 Look for more designs released in the near future by some Kidrobot heavyweight artists. Can't tell you who but if you're a Google ninja you can prolly figure some out. Buy your Magic Love Hello Kitty for $39.95 here. 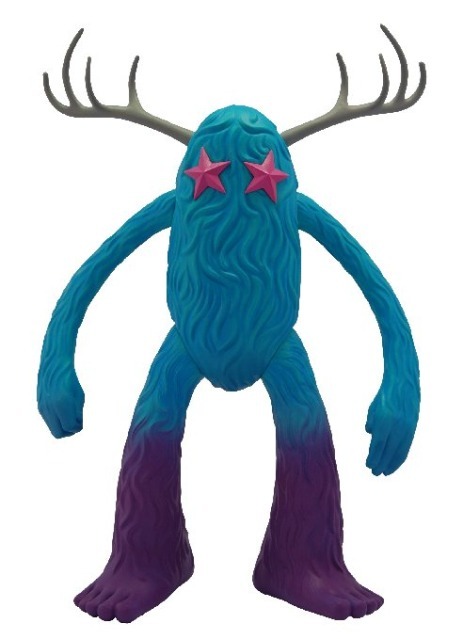 The time has finally come: Jeff Soto's much-anticipated 11-inch figure called The Seeker is finally going to be available on the market! We have placed an order for the Blue colorway and it looks like they'll be shipping to us soon. A limited number of preorders available here. Price is $100.